It started with the help of John Hawelu Poloailehua. Poloailehua was born in Kukuihaele, Hamakua, Hawaiʻi in about 1838; at the age of 14 he moved to Honolulu. In February of the next year, when he was incapacitated by a violent fever, he asked for and received a Bible; it was placed on his chest. He prayed while keeping his eyes closed and holding the Bible, as soon as he opened the Bible, read a verse and pledged his faith, he recovered from his illness. April 16, 1853 (the date which Kekipi considers was the beginning of the church) is when Poloailehua, still a 15-year-old boy, started his mission work after he recovered from his illness. Kekipi moved to Oʻahu and joined the Kaumakapili Church; he seemed to develop his work inside the congregation as he had in Kohala, Hawai’i. On July 31, 1897, a new church building (on Cooke Street in Kaka’ako) was sanctified and named Ke Alaula O Ka Mālamalama. With this church as a mother church, more than ten sister churches were founded on Hawaiʻi, Maui, Lānaʻi and Molokaʻi. Church members believed that Hawaiians were descended from Hebrews and Egyptians and that ancient Hawaiian religion evolved from the same source as Christianity. Teaching that the causes of illness and misfortune could be discerned after praying and fasting, the church gained many adherents among prominent individuals in the Hawaiian community. The church emphasized repentance as a premise to salvation. In the practices of Hoʻomana Naʻauao, the importance of visions was one of the main characteristics. It was the largest independent Hawaiian Church; several offshoot churches broke away in the 1930s and the 1940s. He attended the District School for several years, and in 1852 went to the Hilo Boarding School where he remained only a few months, entering Lahaina Seminary in 1853. Returning to Kona he opened an independent school which was maintained for a number of years. During this time however he acted as the efficient assistant pastor in the Kailua church of Reverend Asa Thurston. In 1864, at the Evangelical Association for Hawaiʻi Island meeting in Waimea, Pilipo received his license. The next year he was ordained a minister. On February 12, 1874, nine days after the death of King Lunalilo, an election was held between the repeat candidate David Kalākaua and Queen Emma, widow of King Kamehameha IV. Pilipo supported Emma – she lost. King Kalakaua became so incensed by Pilipo’s critique of his government’s dealings with Spreckels that he personally intervened in the 1886 general election campaign to ensure that Pilipo was not reelected. Pilipo was defeated by JK Nahale by 19-votes; Pilipo died March 25, 1887. (Hawkins) The image shows George Washington Pilipo. In 1880, the family came to Honolulu by way of California. Wall (and some of his children) left some important legacies in Hawaiʻi. Charles was an important nineteenth century Honolulu architect, some of the buildings he designed are still here; several have been lost, but not forgotten. Charles J Wall participated, or led the design of ʻIolani Palace, Kaumakapili Church, Lunalilo Home and the Music Hall/Opera House. The design and construction of the ʻIolani Palace took place from 1879 through 1882; three architects were involved: Thomas J Baker, Charles J Wall and Isaac Moore. The Baker design generally held in the final work. A quarrel broke out between Baker, Samuel C Wilder (Minister of the Interior) and the Superintendent of Public Works. Shortly after the cornerstone was laid on December 31, 1879; Baker apparently ended his connection with the Palace. According to the March 31, 1880 Hawaiian Gazette, Wall had “skillfully modified and improved” some of the objectionable features of the original design. (Peterson) Wall was succeeded by Isaac Moore after about nine months. ʻIolani Palace was the official residence of both King Kalākaua and Queen Lili‘uokalani. After the overthrow of the monarchy, ʻIolani Palace became the government headquarters for the Provisional Government, Republic, Territory and State of Hawai‘i. During WWII, it served as the temporary headquarters for the military governor in charge of martial law in the Hawaiian Islands. Government offices vacated the Palace in 1969 and moved to the newly constructed capitol building on land adjacent to the Palace grounds. It started as a thatched-roof adobe structure erected in 1839 on the corner of Smith and Beretania Streets. The adobe building was torn down in 1881 to make way for a new brick edifice. The cornerstone for the new church was laid on September 2, 1881 by Princess Liliʻuokalani (on her birthday.) Seven years later the new building was completed. It was an imposing landmark, first of its kind, and visible to arriving vessels and land travelers. It was dedicated on Sunday, June 10, 1888. In January, 1900, disaster struck. The Chinatown fire engulfed the entire building leaving only the brick walls standing. On May 7, 1910, the congregation broke ground for the third church building. It was dedicated on June 25, 1911, the same day in which the 89th Annual Conference of the Hawaiian Evangelical Association (ʻAha Paeʻaina) was hosted by the church. The coronation of William Charles Lunalilo took place at Kawaiahaʻo Church in a simple ceremony on January 9, 1873. He was to reign as King for one year and twenty-five days, succumbing to pulmonary tuberculosis on February 3, 1874. His estate included large landholdings on five major islands, consisting of 33 ahupuaʻa, nine ‘ili and more than a dozen home lots. His will established a perpetual trust under the administration of three trustees to be appointed by the justices of the Hawaiian Supreme Court. Lunalilo was the first of the large landholding aliʻi to create a charitable trust for the benefit of his people. The purpose of his trust was to build a home to accommodate the poor, destitute and infirm people of Hawaiian (aboriginal) blood or extraction, with preference given to older people. In 1879 the land for the first Lunalilo Home was granted to the estate by the Hawaiian government and consisted of 21 acres in Kewalo, near the present Roosevelt High School. The construction of the first Lunalilo Home at that site was paid for by the sale of estate lands. The Home was completed in 1883 to provide care for 53 residents. An adjoining 39 acres for pasture and dairy was conveyed by the legislative action to the Estate in 1888. After 44 years, the Home in Kewalo (mauka) had deteriorated and became difficult and costly to maintain. The trustees located a new 20-acre site in Maunalua on the slopes of Koko Head. In 1881, a Music Hall was built across the street from ʻIolani Palace, where Ali‘i regularly joined the audiences at performances. Queen Lili‘uokalani is even said to have written her own opera. (Ferrar) It was built by the Hawaiian Music Hall Association. Despite its name, the Opera House was not primarily a venue for classical entertainment. Many of its bookings were melodramas and minstrel shows, two very popular forms of theater at the time. Then, it was the first house to show moving pictures in Hawaiʻi. Wall died at Honolulu on December 26, 1884. 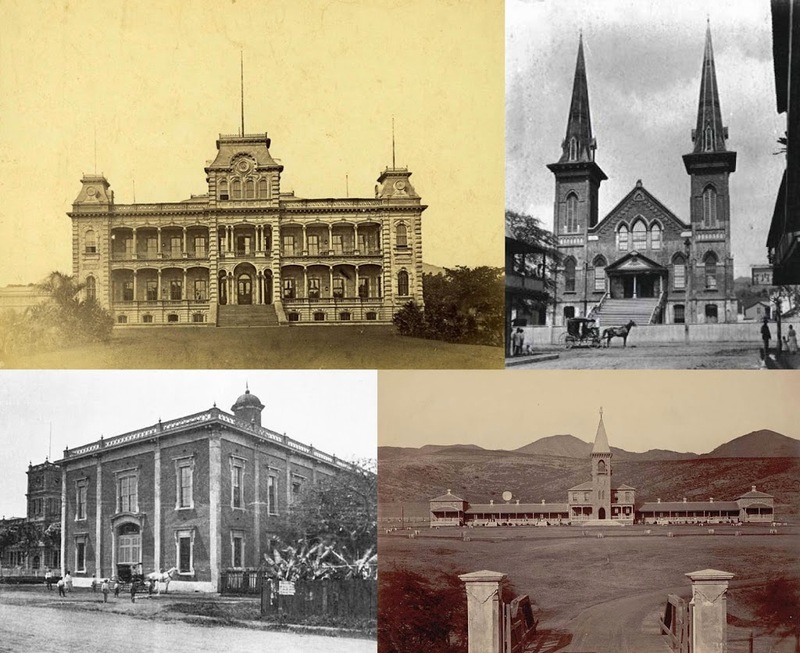 The image shows some of Wall’s designs – ʻIolani Palace, Kaumakapili Church, Lunalilo Home and the Opera House. In addition, I have added others similar images in a folder of like name in the Photos section on my Facebook and Google+ pages. From its first thatched-roof adobe structure erected in 1839 on the corner of Smith and Beretania Streets, to its present day structure built in 1910, the people of Kaumakapili have survived Hawaiʻi’s most turbulent times. Starting in 1837, “the common Hawaiian folk of Honolulu” started petitioning Rev. Hiram Bingham, head of the Hawaiian Mission, to establish a second church or mission in Honolulu (Kawaiahaʻo being the first). They requested that the Rev. Lowell Smith be their pastor. The 1837 annual ʻAha Paeʻaina (the annual meeting and gathering of the churches and ministers) granted their request. Chief Abner Pākī and wife, Konia, granted the lot on the corner of Smith and Beretania Streets for this mission – the area then known as Kaumakapili. Pākī and Konia were parents of Bernice Pauahi Bishop, founder of the Kamehameha Schools. On April 1, 1838, the first Sabbath of the month, the Rev. Hiram Bingham assisted Rev. Lowell Smith in organizing the church, “twenty-two persons were received by letter from Kawaiahao church two from Ewa and one from Kauai and forty-nine were received on profession of faith.” (Smith) This was the commencement of Kaumakapili Church. The first Church building was constructed of adobe with a thatched pili roof and was large enough to accommodate 2,500 people. On August 29, 1839 the church building was dedicated. In 1865, as King Kamehameha V was nearing death, he asked High Chiefess Bernice Pauahi to be his successor, but she refused. According to law, an election was held and Kaumakapili was used as Honolulu’s town hall during this and many future political crises. The adobe building was torn down in 1881 to make way for a new brick edifice. It was an imposing landmark, first of its kind, and visible to arriving vessels and land travelers. It was dedicated on Sunday, June 10, 1888. This church played an ironic role during Kalākaua’s reign. The Honolulu citizens held a meeting in this building protesting Kalākaua’s capriciousness and appointment of an Italian-American adventurer named Moreno as his Minister of Foreign Affairs and the appointment of a new cabinet, whose “grotesque unfitness” caused the people to be up in arms. The result was the dismissal of Moreno four days after his appointment. In January, 1900, disaster struck. The presence of bubonic plague in the Chinatown area caused the health authorities to take drastic measures by burning sections of Chinatown. Sparks fell on the wooden steeples and fire engulfed the entire building leaving only the brick walls standing. Honolulu’s landscape was changing, so the old site at Smith and Beretania Streets was sold and a new one bought at the corner of King and the then Simerson (now Pālama) Streets in Pālama. Services were held in a temporary small wooden chapel on Austin Lane, behind the old Palama Fire Station. Here, for the next 10 years, the church developed its ministry with a strong emphasis on Sunday School ministering; particularly to the girls from the old Reform School that was situated on the site of the present Kaʻiulani Elementary School. During these years and the years to follow Rev. Poepoe fostered the idea of enlisting young Hawaiian men into the Christian ministry. This time of Kaumakapili’s history enjoyed a very active Sunday School under several outstanding superintendents – among whom were Augustus Smith, only son of Founders Rev. Lowell and Abigail Smith, and one of their daughters, Mrs. Benjamin F. Dillingham. On May 7, 1910, Master Harold R. Erdman, great grandson of the Rev. Lowell Smith, broke ground for the third church building. It was dedicated on June 25, 1911, the same day in which the 89th Annual Conference of the Hawaiian Evangelical Association (ʻAha Paeʻaina) was hosted by the church. On the day of dedication of the original two stained glass windows, the great grandson of Rev. Lowell Smith, Lowell S. Dillingham, was baptized on September 13, 1912. The Gothic Revival-style church is the most prominent feature of the urban Kalihi-Palama neighborhood. The bell tower steeple stands 96 feet above the surrounding properties. The campus features an expanse of grass lawn at the front of the building bordered by two paved parking lots and is surrounded by a low dressed-basalt wall with piers at the walk and driveway openings. The inspiration and information on this post came primarily from kaumakapili-org and The Friend. 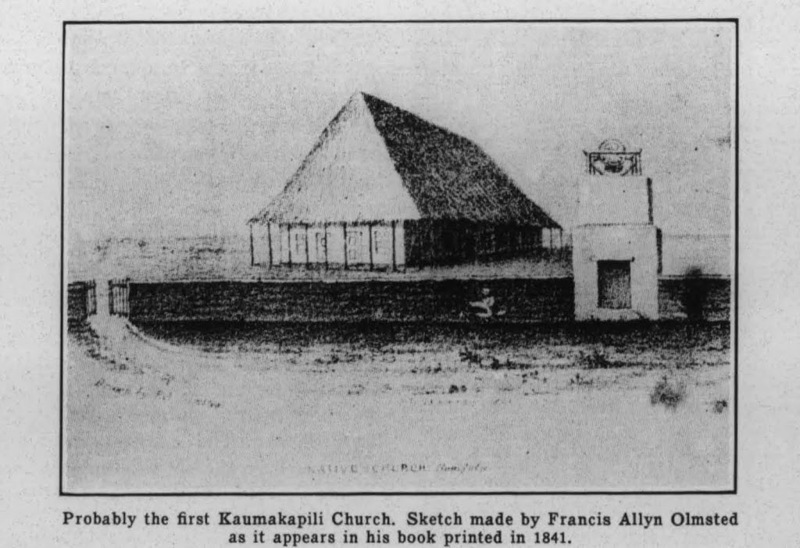 The image shows what is believed to be the initial Kaumakapili Church (in about 1841 – The Friend.) In addition, I have included other related images in a folder of like name in the Photos section on my Facebook and Google+ pages.